The oldest banking award in the country just got a qualitative makeover. The oldest banking award in the country just got a qualitative makeover. Literally. When Business Today and KPMG - partners for this study since 1997, with the earlier ones since 1993 being partnered with Crisil - got together to plan this year's survey, we decided to continue to produce our highly regarded, financial performance-based rankings. At the same time, we decided to introduce a second phase, where a high-quality jury would decide on some new awards that would be based on things beyond the numbers. So, this year we have three new qualitative awards - for Innovation, Digital Banking and Financial Inclusion - for which all of India's top banks applied with fervour, penning their initiatives in great detail. To top it all, when the jury met, it decided to give three more subjective awards - Bank of the Year, Most Improved Bank and Most Future-ready Bank. The jury itself comprised just the right mix of people whose collective wisdom could be banked upon (no pun intended) to capture the best performers. Former Chairman of India's largest bank, State Bank of India, O.P. Bhatt, led the way. Bhatt, who headed SBI between 2006 and 2011, when the economy swung from extreme buoyancy to a global slowdown post the 2008 Lehman crash, brought in insights about one-offs or outlier items in the quantitative numbers. Bharat Doshi, Chairman, Mahindra Finance, an M&M veteran for over four decades, brought in the perspective of corporates, who are clients of banks. Doshi, who was part of the RBI's financial inclusion committee, was in his elements when the jury discussed the financial inclusion award. Given the influence of technology in modern banking, the jury needed a member who could give insights about the digital and technology-led innovations that are taking place in banking. Chaitanya Kamat, MD & CEO, Oracle Financial Services India, fitted perfectly into that role. Kamat has over three decades of experience in financial services, consulting and business transformation. Before joining Oracle, he worked in the private equity space, headed a start-up and worked for Accenture. And Ashok Wadhwa, Group CEO, Ambit Holdings Pte, brought in the intellectual bandwidth and market knowledge to make the discussion livelier. The jury met three times - including in person, on phone and over e-mail - indicating the depth to which it took the deliberations. It discussed several issues, including penalties imposed by RBI and other regulators or investigative agencies, other qualitative factors like management profile, board strength and independent directors, organisational structure, plus details on branch expansion, technological readiness, absolute increase in current and savings account (CASA), deposit base, asset quality with restructured assets, capital adequacy, fee income over a five-year period, etc. The outcome of these discussions can be seen in the Jury Winners table on page 96. For the rankings based on pure financial performance, the data was taken from published annual reports of the banks for the period 2011/12 to 2014/15. The survey covers 65 scheduled commercial banks that had annual reports published in public domain or provided their annual reports at the time of conducting the survey prior to October 31, 2015. In total, five banks were included in the 2014/15 survey for the first time. These banks have completed four years of operations as on March 31, 2015, and their annual reports are available in public domain for this period. As in the past, scheduled commercial banks with a balance sheet size of less than Rs 1,000 crore (as on March 31, 2015) have not been considered for the survey. Further, scheduled commercial banks whose financial statements were not available to us, or banks which have not completed four years of operations in India as on March 31, 2015, or which have merged with other banks, did not form part of the survey. There are five sub-parameters in this category. They are: (a) growth over 2013/14 in deposits, alongside three-year compounded annual growth rate (CAGR) of total deposits; (b) growth over 2013/14 in loans and advances, alongside three-year CAGR in loans and advances; (c) growth over 2013/14 in fee income (commissions, exchange, brokerage plus miscellaneous income), alongside three-year CAGR in fee income; (d) growth over 2013/14 in operating profit, alongside three-year CAGR in operating profit; and (e) absolute increase in market share of deposits and of current account savings account (CASA) balances. There are three sub-parameters: size of total deposits, size of operating profit, and size of balance sheet for 2014/15. There are four overarching sub-parameters, each with further sub-divisions. Total NPA growth ratio: additions to NPAs during the year as a percentage of average net advances; Provision coverage: provisions for NPA as a percentage of gross NPA closing balance; Net NPAs as a ratio of net advances: gross NPAs net of provisions expressed as a percentage of net advances; Restructured assets as a percentage of total average loans and advances; Outstanding restructured assets as on March 31 as a percentage of outstanding loans and advances. For the purpose of determining the rankings based on the provision coverage ratio parameter, banks having zero non-performing assets (NPAs) are assigned the highest rank in that parameter. 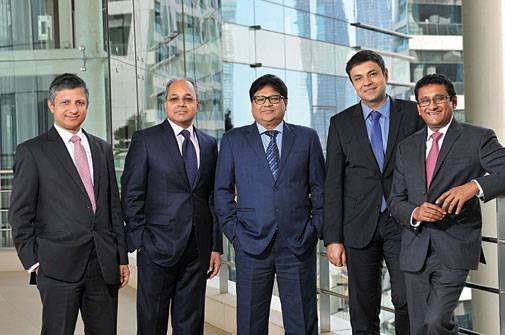 The KPMG team (L-R): KPMG partners Kunal Pande, Arjun Vaidyanathan, Naresh Makhijani, Shashwat Sharma and chartered accountant Manoj Kumar Vijai. Cost to income ratio: operating expenditure as a percentage of operating income; Cost to average asset ratio: operating expenditure as a percentage of average assets; Absolute increase in return on assets: basis points increase in return on assets (net profit over total average assets) from 2013/14 to 2014/15; percentage increase in ratio of operating profit to total income from 2013/14 to 2014/15. Return on assets: ratio of net profit to total assets for 2014/15; Fee income as a percentage of total income, Return on capital employed: reported net profit divided by average net worth; Net interest income as a percentage of average working funds (average total assets minus average total other liabilities). Capital adequacy ratio: capital-to-risk weighted assets ratio for 2014/15; Tier-I capital: total of equity capital and disclosed reserves. For each bank a score is assigned for each of the 28 sub-parameters, based on its ranks on the parameters. The score under each parameter is then multiplied by the parameter's weightage. The results are aggregated to arrive at the total score. Banks not considered for the 2014/15 survey: In total, five banks that were included in 2013/14 survey were not considered for the survey in 2014/15. Antwerp Diamond Bank: The bank is in process of selling off its assets and winding up operations in India. ING Vysya Bank: Merged with Kotak Mahindra with effect from April 1, 2015. Mashreq Bank PSC: Non availability of financials for 2014/15 from the banks despite several communications. State Bank of Mauritius: Non- availability of financials for 2014/15 from the banks despite several communications. Krung Thai: Balance Sheet size is less than Rs 1,000 crore, hence it has not been included as per survey methodology. New banks added in the 2014/15 survey: In total, five banks - Australia and New Zealand Banking Group Limited, Credit Suisse, FirstRand Bank Limited, Rabobank International and Societe Generale - were included in the 2014/15 survey for the first time. These banks have completed four years of operations and their annual reports are available in the public domain for this period.